We’ve come a long way with Moll so far and in Moll’s case, it shows. Recently sprung from the gaol, she’s back to her dreary lodgings and considerably worse for wear. Syphilis has come knocking at her door, or shall we say teeth, as the medicine’s side effect has made itself known by now. Moll’s head is wrapped, her teeth presumably loosened beyond repair, and she looks to be moaning in pain. Gone are the silks and jewels of the harlot. Her entire body is now shrouded in cloth, no longer accessible, her desirability but a memory. Much to the chagrin of her maid, Moll’s doctors–one of them Dr. Jean Misaubin, a renowned French quack–are arguing about the proper way to proceed. The options? More mercury pills, maybe a little cupping, a little bloodletting? Trouble is, Dr. Richard Rock, whose advertisement for anti-venereal pills lies on the floor (much like the pastoral letter of Plate 3), is as useless as the quack. There’s no cure for Moll but death and I think we can all agree that’s not a very good one. Treating syphilis with mercury pills was primary until the 20th century, although in truth it made the pox a more difficult condition as symptoms were heaped on top of symptoms. Tooth loss, diminished sensory perception, and neurological damage were just some of the painful side effects. Moll’s overwhelming misfortunes aside, she does appear to have recouped a few protectors. One is her maid—the same who turned devious when they were suffering in the gaol in Plate 4. But the past is now resigned to the past. Moll shares her maid’s condition, indeed Moll is in greater decline, and maybe this explains the maid’s renewed defense of her mistress. The landlady, or bawd, is presently the one taking advantage of Moll, availing herself of the room’s untended possessions. Notice in particular the shoes to the left of the bawd’s knee. They appear to be the same pair that Moll’s maid donned in the gaol. How’s that for full circle? Moll’s second protector is noticeably absent. Remember the Jewish merchant from Plate 2? A Passover biscuit, or honeycombed circle above the door multitasking as a fly-catcher, suggests that he’s been for a visit. In her current state, it is doubtful Moll would have the funds to pay for her lodgings and/or her medical care. Has her former protector taken pity on her then, perhaps thanking his lucky stars he got out from between her thighs when he did? Plate 2 and Plate 5 have similarities worth pointing out. First, the table in the center of the plate is being knocked over, but this time not by Moll. At this stage, her arrogance is gone. In fact, she is barely conscious. 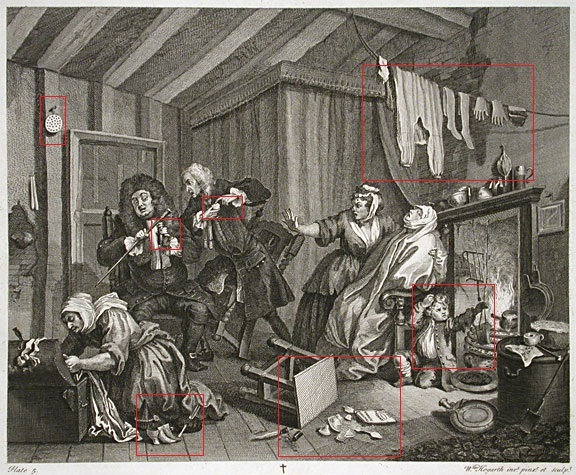 The table in Plate 5 much more resembles the table in Plate 3, the beginning of her demise. Children also appear in both plates, but their presence is remarkably contrasted. 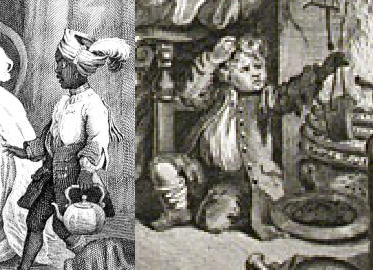 At Moll’s height in Plate 2, the child is an exotic slave kept for the sole purpose of flaunting her wealth. By Plate 5, the child—misbegotten by a prostitute and a patron—is anything but prestigious. For one, he’s squatting on the floor like an urchin; two, he’s scratching his head and playing with the fire absent any supervision. Is this suggestive of the “evils” that befall those who sin? Do the sinners perpetuate societal problems in the most inevitable way—through their progeny? A harsh assessment, but one Hogarth is going for. If you recall the details in Plate 4, the indebted card player had a daughter who possibly suffers from Down’s syndrome or another syndrome that affects cognitive functioning. With his round face and absentminded expression, the little boy in Plate 5 may be similarly afflicted. Given that mental disorders and even disease were once thought of as a punishment for sin, I think we can logically apply this here. Moll’s prostitution has led to illness, but who is the true perpetrator of society’s ills? Moll? Her patrons? The hypocrites who purchased Hogarth’s works just to prove their virtue? This is the best part about Hogarth. He made his living by mocking society. He doesn’t put much faith in the Church, the judicial system, or his time’s social police force, the Society for the Reformation of Manners. Indeed, he suggests those who make highly public shows of decency and morality are the most immoral of us all and leaves us wondering: is this true?